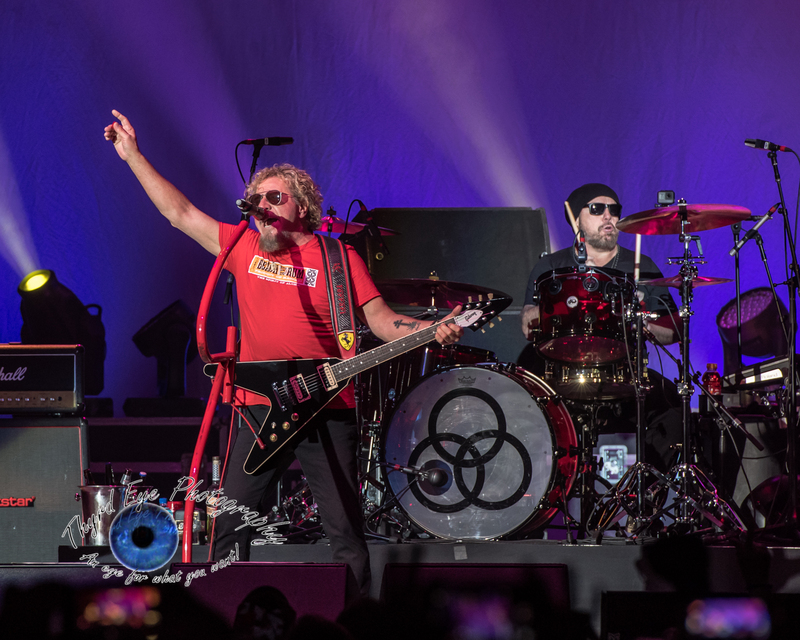 Sammy Hagar and The Circle perform at the KSHE 95 50th Birthday Party at Hollywood Casino Amphitheatre in Saint Louis Saturday. Photo by Sean Derrick/Thyrd Eye Photography. Saint Louis has its fair share of recognizable icons in the Jefferson National Expansion Memorial (better known as the Gateway Arch), the Budweiser brewery, Forest Park, and the St. Louis Cardinals just to name a few. However, it also has the longest running rock ‘n roll radio station in the country in KSHE 95. The radio station is celebrating its 50th year of existence. In this day and age it is incredibly remarkable that the station has weathered all that has been thrown its way and not bowed to pressure to change formats. It is a testament to dedication to the fans of the genre who love them some KSHE. To honor the impressive milestone the station had to come up with an equally impressive party. They did just that last night with a concert featuring Saint Louis’ favorite adoptive son as the headliner: Sammy Hagar. Of course that was a no-brainer, given the love affair the city has with the Red Rocker. But to kick it up a notch the station also got fellow Rock and Roll Hall of Famer’s ZZ Top to OPEN for Sammy! ZZ Top is continuously a top draw whenever they come to Saint Louis in a headlining fashion themselves. Ed Roland of Collective Soul performs at the KSHE 95 50th Birthday Party at Hollywood Casino Amphitheatre in Saint Louis Saturday. Photo by Sean Derrick/Thyrd Eye Photography. 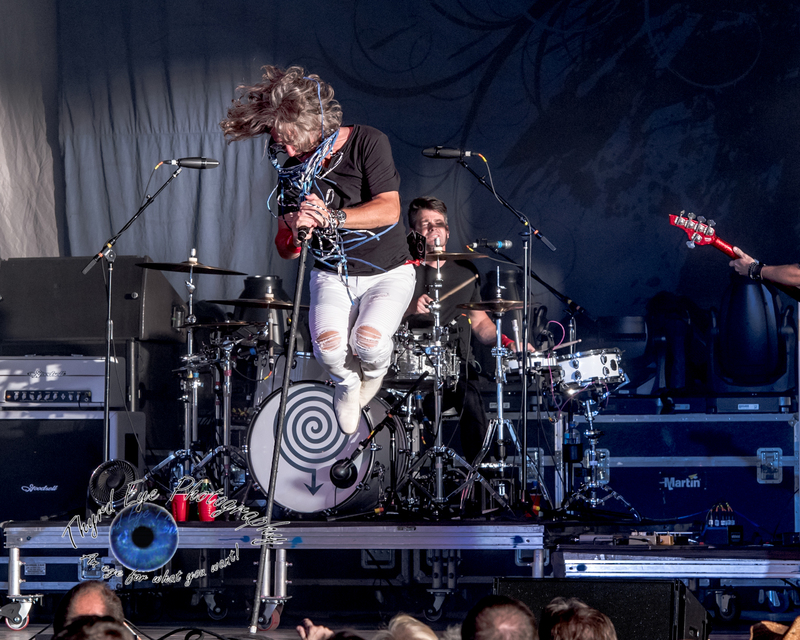 Collective Soul, who were already on Sammy’s tour bill were a perfect fit to open, since they are also very popular here and have been a staple on the air since the 1990’s. With a bill like that it is easy to see why the concert was a complete sell-out. Kicking off the events was a short set from Sammy’s son Andrew, who sang a easy going compliment of songs with just he and a friend on acoustic guitars. Andrew Hagar performs at the KSHE 95 50th Birthday Party at Hollywood Casino Amphitheatre in Saint Louis Saturday. Photo by Sean Derrick/Thyrd Eye Photography. 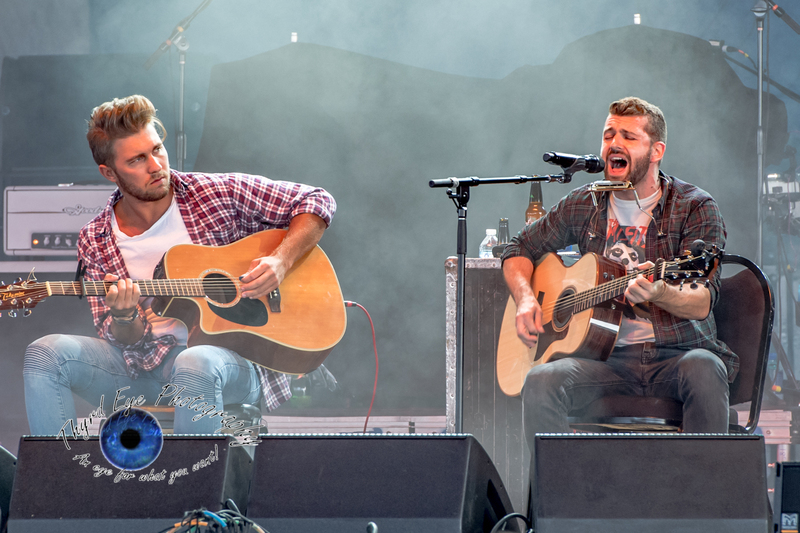 They performed a new song off of their yet to be titles tenth studio release, due in the spring, called “Right as Rain”. While a lot of bands put extended jams into the songs Collective Soul put an extended ending to some of their songs. In particular, “Shine”, which also had a long dramatic pause which fooled some of the newer photographers- thinking it was the end of the allotted three-song shooting set, causing them to leave (a good learning experience for them). And the end of “Run” was drawn out, leaving only Ed Roland on acoustic guitar leading the crowd through a repeated singing of the chorus even as he left the stage – still playing his guitar from the backstage area. A nice dramatic ending. 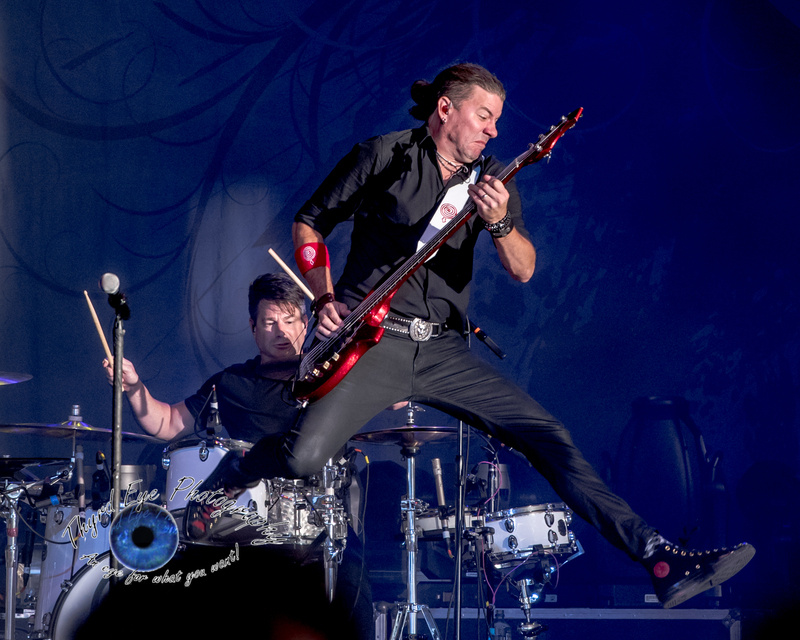 Collective Soul’s Will Turpin gets some air performing at the KSHE 95 50th Birthday Party at Hollywood Casino Amphitheatre in Saint Louis Saturday. Photo by Sean Derrick/Thyrd Eye Photography. Veteran rockers ZZ Top followed. And while the power trio from Texas may not be as mobile as Collective Soul their easy-going attitude fit well with their hard rocking hour long set that had little talking and more rocking, 14 songs crammed into an hour that didn’t seemed rushed at all. 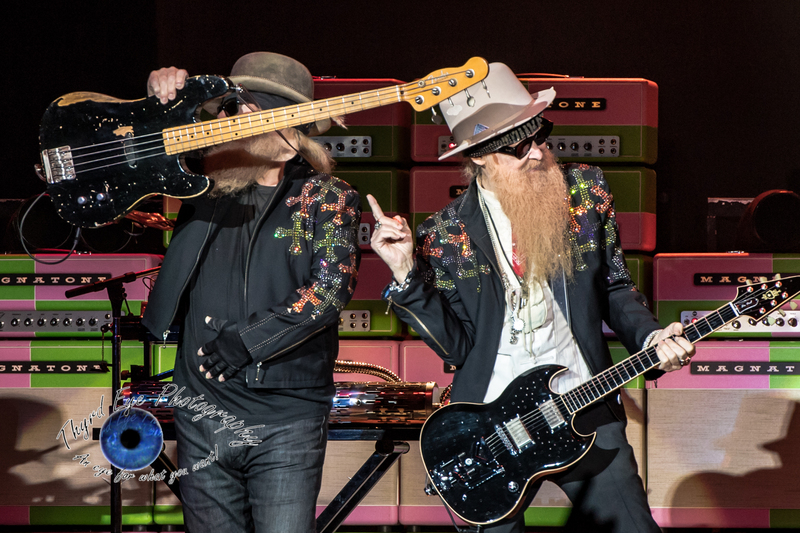 ZZ Top (guitarist/vocalist Billy Gibbons, bassist/vocalist Dusty Hill, and drummer Frank Beard) like to mix in style with their signature sound. They did their best choreography moves, including the knee wobble (though not as much), and they even broke out the famous fuzzy guitar and bass for “Legs” that was featured in the video. 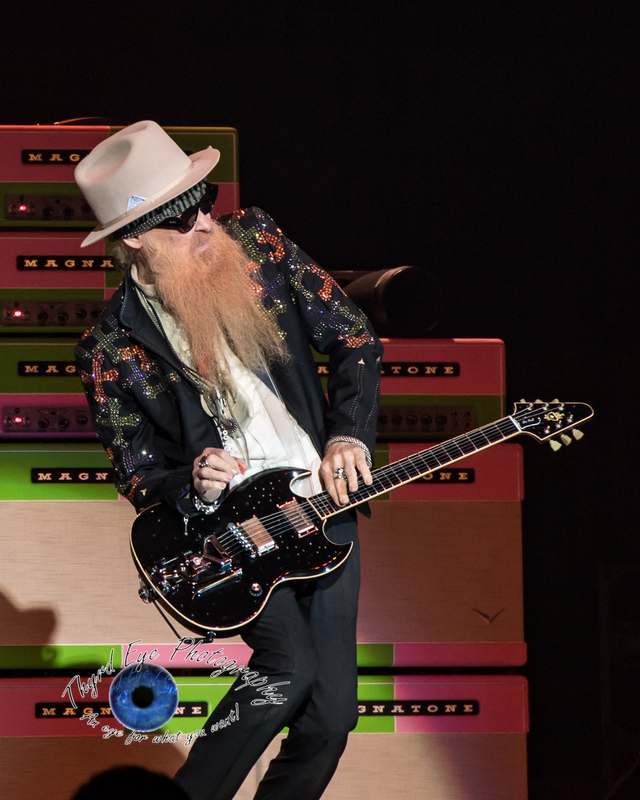 Billy Gibbons of ZZ Top performs at the KSHE 95 50th Birthday Party at Hollywood Casino Amphitheatre in Saint Louis Saturday. Photo by Sean Derrick/Thyrd Eye Photography. They tried their hands at “Sixteen Tons”, the country staple by Merle Travis, and while they did an ok job in the rendering it was nice to see them get out of their comfort zone for a bit. The crowd was really amped up now for Sammy (Ok, when aren’t they?). For photographing it we were assigned the soundboard, which means we could shoot anywhere in the aisle back by the sound board. Most of us had step stools to get up above the crowd, but for most of the first song that didn’t matter as just about everyone had an arm in the air rocking out with the Red Rocker. It was energizing and kept us on our toes. Sammy’s set comprised songs from his over 40 years in the music scene, including “Rock Candy” from 1973, the song Hagar said was first played by KSHE95 before any other station in the country, and thus, helped launch his career. Hagar pounded through a 16 song set that was supposed to end at 10:30, but ran almost 20 minutes over due to extended jams, mutual love and admiration between Sammy and the crowd and stories from Hagar. At one point Billy Gibbons came out on stage while the band was performing Van Halen’s “Why Can’t This Be Love” and hugged Hagar. It was a moment Hagar said was one of the highlights of his career, especially that it happened in Saint Louis. Hagar’s band, The Circle (consisting of Hagar on guitar and vocals, longtime band mate in several band Michael Anthony on bass, guitarist Vic Johnson, and drummer Jason Bonham, son of the late Led Zeppelin drummer John Bonham) meticulously played through a nearly flawless set. Including doing a fine job of extending the bridges when Hagar was busy wearing then signing every Cardinals and Blues jersey adorned with his name and 55 on the back, various pieces of memorabilia, signs, shirts, and a bra which Bonham put on his head. 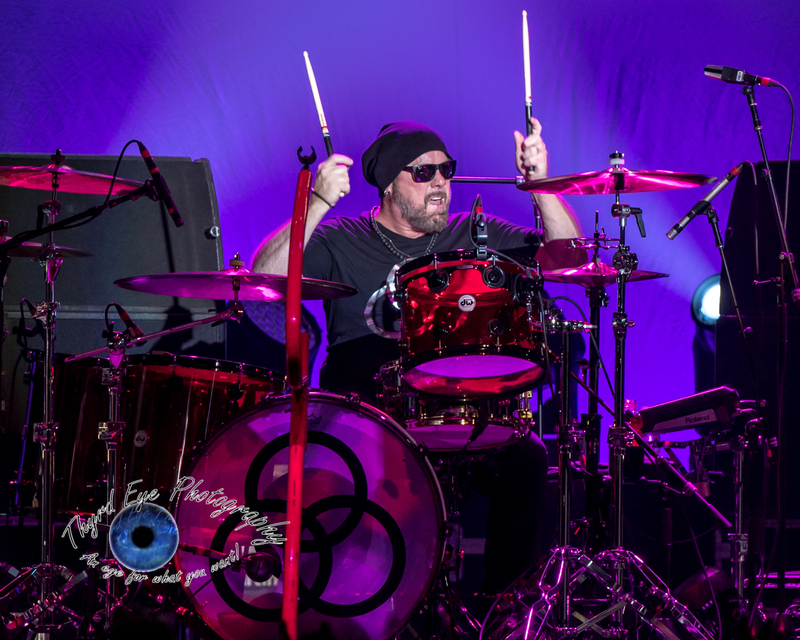 Jason Bonham of Sammy Hagar and The Circle performs at the KSHE 95 50th Birthday Party at Hollywood Casino Amphitheatre in Saint Louis Saturday. Photo by Sean Derrick/Thyrd Eye Photography. I remember back in 2011 when Hagar’s band Chickenfoot came to town guitarist Joe Satriani was amazed and stunned at all the stuff thrown onstage and that Hagar took time to sign every one. Satriani had heard of the love affair between the city and singer but thought it was exaggerated. After seeing it in person he became a believer. After seeing the set that Hagar did and the energy he has, just 2 weeks shy of his 70th birthday just about anyone would become a believer that he has found the fountain of youth. He’s still got the youthful energy, can jam with the best of them, and still has the pipes to back it up. This was the last show on his tour (he will play a few dates in Cabo Wabo, Mexico at his cantina to celebrate his birthday, but he let loose drinking several different alcohols from his own label and commenting “This is the last show, so I’m getting f***’d up!”. But the alcohol didn’t prevent him from giving a top-notch performance, which the crowd of 19,000 loved. With the way he looked and sounded I don’t doubt he will be back several more times. Until then Saturday’s concert will have to tide the fans over, and by all indications it certainly will. Check out the full photo gallery beow after the setlists and let us know what you thought of the show, if you were lucky enough to get a ticket. ZZ Top perform at the KSHE 95 50th Birthday Party at Hollywood Casino Amphitheatre in Saint Louis Saturday. Photo by Sean Derrick/Thyrd Eye Photography. Collective Soul performs at the KSHE 95 50th Birthday Party at Hollywood Casino Amphitheatre in Saint Louis Saturday. Photo by Sean Derrick/Thyrd Eye Photography. Michael Anthony of Sammy Hagar and The Circle performs at the KSHE 95 50th Birthday Party at Hollywood Casino Amphitheatre in Saint Louis Saturday. Photo by Sean Derrick/Thyrd Eye Photography. Dusty Hill of ZZ Top performs at the KSHE 95 50th Birthday Party at Hollywood Casino Amphitheatre in Saint Louis Saturday. Photo by Sean Derrick/Thyrd Eye Photography. Ed Rollin of Collective Soul performs at the KSHE 95 50th Birthday Party at Hollywood Casino Amphitheatre in Saint Louis Saturday. Photo by Sean Derrick/Thyrd Eye Photography. 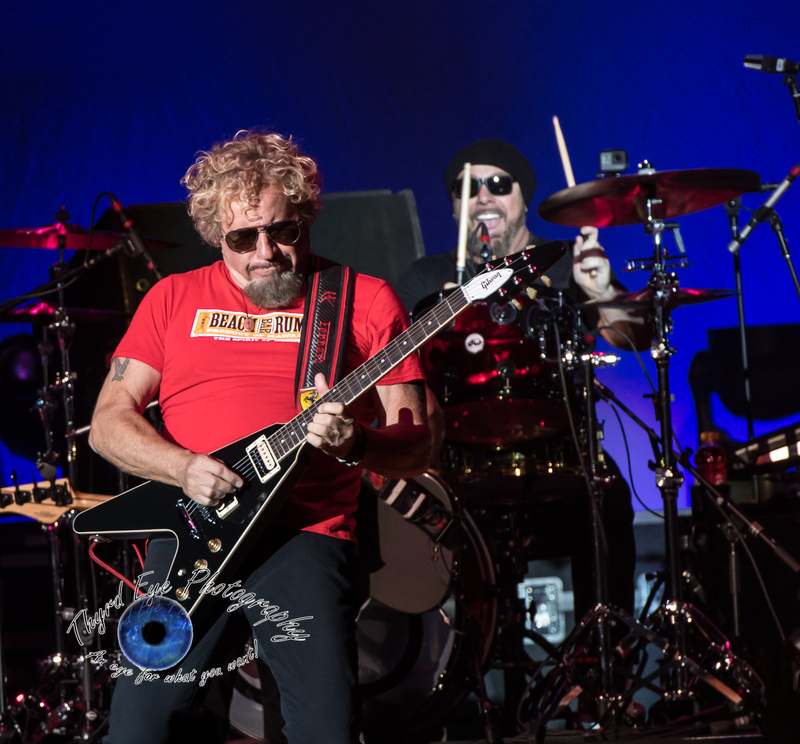 Sammy Hagar performs at the KSHE 95 50th Birthday Party at Hollywood Casino Amphitheatre in Saint Louis Saturday. Photo by Sean Derrick/Thyrd Eye Photography. Vic Johnson of Sammy Hagar and The Circle performs at the KSHE 95 50th Birthday Party at Hollywood Casino Amphitheatre in Saint Louis Saturday. Photo by Sean Derrick/Thyrd Eye Photography.